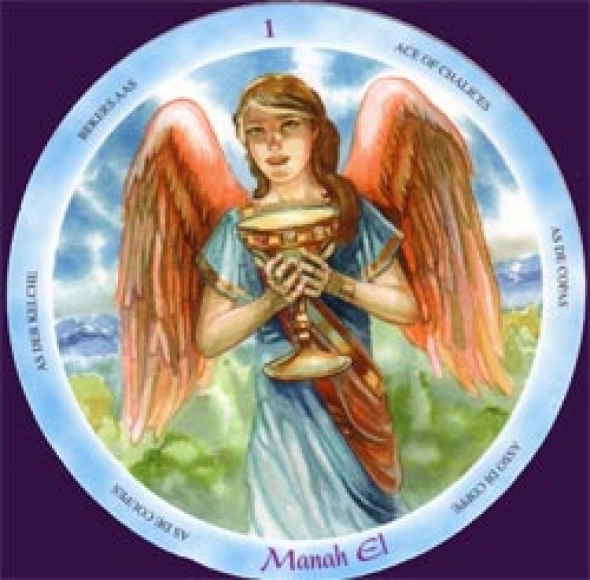 round shape of the cards was chosen to remind us "of the angelic circle of love and protection always surrounding us". Back Design Female winged angel surrounded by pastel circular designs. This deck has been widely researched by Guidetta Dembach in ancient Hebrew texts. I think it is deliberate that many of these angelic beings are not well known and I believe the intent of this deck is as a basis to launch a study program for those interested in the abundance of angelic light beings named in Hebrew teachings throughout history. I thank Guidetta Dembach for such in depth research; the angel’s names are authentic and ancient. Its blue washed out appearance gives this deck a slight otherworldly appearance. I do find it lacking in vibrancy as if its characters are just not quite within reach and perhaps too human. I also feel the sections of the Tarot; Major, minor and court are irrelevant in this Tarot as it is more about specific angelic beings corresponding to element and numerological vibrations than journeys through life processes. With time I would find this deck enormously enlightening. It has certainly sparked my awareness of the enormity of the angelic realm and made me question what that realm adds to the magical levels of study. Frederico Penco has been involved in creating other Tarots, namely the current Sacred Sites Tarot which is beautiful but again I wouldn’t call it a process orientated deck. Perhaps Frederico Penco and Guidetta Dembach are asking us to study more deeply what can be contained within Tarot.